True Logarithmic Response from 3 to 55,000 Lux! This GA1A12S202 based sensor breakout is a big step-up from the basic CdS photo-cell. The biggest improvement over plain photocells is a true log-lin relationship with light levels. Most light sensors have a linear relationship with light levels, which means that they're not very sensitive to changes in darkened areas and 'max' out very easily when there's a lot of light. Sometimes you can tweak a resistor to make them better in dark or bright light but its hard to get good performance at both ends. This sensor is logarithmic over a large dynamic range of 3 to 55,000 Lux, so it has a lot of sensitivity at low light levels but is also nearly impossible to "max out" so you can use it indoors or outdoors without changing code or calibration. Since the sensor is fabricated on a chip, there are also fewer manufacturing variations, so you won't have to re-calibrate the sensor from one board to another. 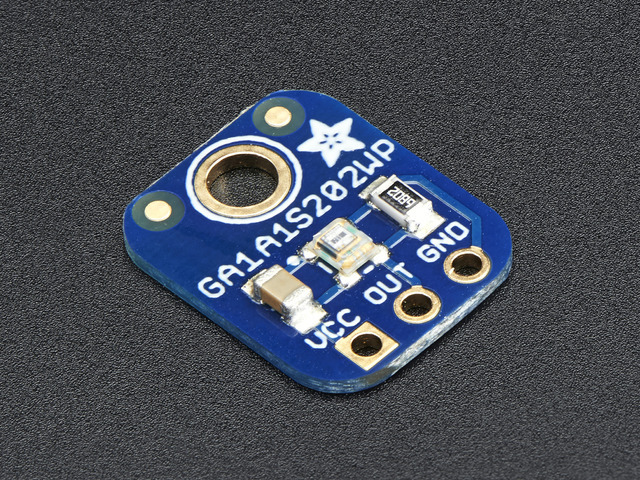 The GA1A12S202 sensor breakout is small and easy to integrate into any project. It makes a nice upgrade from a CdS photo-cell. It does not require a microcontroller, the analog voltage output increases with the amount of light shining on the sensor face. Use it to build a photovore, an automatic lighting system, a photo-meter or any number of light sensitive/light-reactive projects. For more information including graphs, power consumption, etc check out the datasheet. On this breakout we placed a 68KΩ resistor from OUT to ground to turn the current into a voltage. This guide was first published on Jun 22, 2013. It was last updated on Jun 22, 2013. This page (Overview) was last updated on Apr 22, 2019.